I love Ronald Malfi. There. I admitted it. Though it shouldn’t come as a surprise if you follow my reviews. His Floating Staircase was haunting. The Narrows? Frightening. And The Mourning House is the single finest piece of modern horror fiction out there today. But here’s the thing. Typically, when I read a book I really like, I don’t read more by that author. I know, I know. That sounds strange. But I have this fear that the next book I read will be lacking, that it will somehow take away from what I’ve read before. Greatness, after all, is hard to maintain. So when I picked up December Park, I had concerns. What if it wasn’t as good? What if I was disappointed? Oh but my friends, how foolish I was. I had nothing to fear. Well…almost nothing. December Park is a part of a sub-genre I don’t particularly like–the coming of age tale. I don’t really enjoy stories about kids, especially teenagers. Not sure why. I know it’s popular. But not for me. So I approached December Park with some trepidation. That was the first page. By the last one, I was tearing up. I had connected with the characters in a way I could not expect. The story is one you are familiar with. A group of kids find their peaceful town under siege by a serial killer who is stalking their own numbers. They begin to realize they are the only ones who can defeat this evil, and they must face it, no matter what the cost. If it sounds like It, that’s what I thought too. And the comparison isn’t favorable…for It at least. 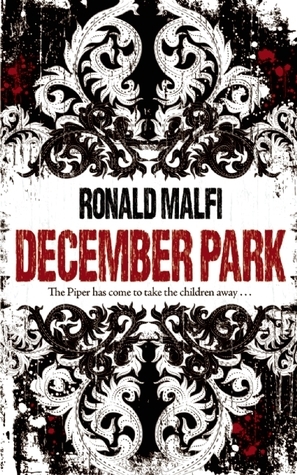 That venerable Stephen King bestseller pales in comparison to December Park. Put simply, Malfi has knocked it out of the proverbial park again with this one. You cannot go wrong with Malfi, no matter which of his books you decide to pick up. But you could do far worse than starting with December Park.